Global investors had to muster the courage to keep calm as news of Cyprus' proposed partial theft of all bank deposits took Wall Street by surprise, closed the country's banks and drove the gold prices higher. The thoughtless idea was intended to capture a portion of the $31 billion in bank assets held by Russians. According to the Financial Times, Cyprus has developed a "well-earned reputation for being a haven for dirty money from Russia." 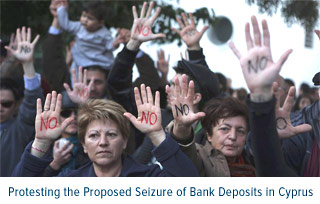 Although Cyprus' government came to its senses and blocked the proposed seizure, the damage has been done. To many people around the world, raising income taxes may be one thing, but changing the rules to steal hard-earned savings from all citizens rattles their confidence. What Adrian Ash of BullionVault says is "most amazing" about this situation is that "small savers are no longer sacred." It's remarkable to see the response from Cypriots, as they protested in the streets, with "NO" stamped on their palms, demanding the government take its hands off their money. It's refreshing to see their pushback to sanity. "Many EU leaders had been deeply reluctant to admit Cyprus into the union in 2004, without a peace settlement that reunified the island. But Greece had threatened to veto the entire enlargement of the EU – blocking Poland, the Czech Republic and the rest – unless Cyprus was admitted. Reluctantly, EU leaders succumbed to this act of blackmail." Five years later, we are seeing the fallout of Cyprus due to Greece's financial woes. Many accuse Greece of cooking the books to get into the EU, and then the country proceeded to blackmail the EU at the expense of other European countries. Crooks get punished, but what about others who unfairly change the rules or break them? Think back to the anger generated by the Ponzi scheme run by Bernie Madoff, who lost $20 billion in cash. In addition, $65 billion in paper wealth vanished. He's serving 150 years in prison, his son committed suicide, and he'll forever be known as a thief and a rat. Since the global financial crisis began, there's been a rash of poor economic decisions from socialist policymakers scrambling to bring in more revenue to cover their overspending. Rather than streamline regulations to facilitate trade and flow of funds or cut back on welfare programs, they'd rather maintain the status quo and increase taxes. In Greece, tough cost-cutting austerity measures were shot down after organized unionized workers were rioting in the streets. France's socialist president, Francois Hollande, has been trying unsuccessfully to increase the top income tax rate to 75 percent in an attempt to "squeeze fat cats and hit the mega-rich, making them bear the brunt of "sacrifices' needed to fix public finances," according to The Guardian last summer. In Hungary and Italy, we have seen the unintended consequences of envy policies after implementing a financial transaction tax. These types of "envy policies" that would be frowned upon by Moses on Mount Sinai aren't only happening across the Atlantic.